Analysis of cerebral magnetic resonance images of 24 subjects with Sydenham's chorea and 48 age-, height-, weight-, gender-, and handedness-matched controls demonstrated increased sizes of the caudate, putamen, and globus pallidus in the Sydenham's chorea group. In contrast, neither total cerebral, prefrontal, or midfrontal volumes or thalamic area were increased. These results indicate the selective involvement of the basal ganglia in Sydenham's chorea. Sydenham's chorea (SC) is characterized by sudden, involuntary, arrhythmic, aimless movements, often accompanied by muscular weakness and psychological symptoms including emotional lability, obsessive-compulsive disorder (OCD), anxiety, impulsivity, and inattentiveness. [1-3] SC is a semi-acute illness usually occurring during childhood or adolescence, following infection with group A betahemolytic streptococci (GABHS), and is a ``major'' criterion of rheumatic fever. In rheumatic fever, antibodies directed against antigens on GABHS may cross-react with certain host tissues in the cardiac, skeletal, or central nervous systems. [5-7] CNS involvement, particularly of the basal ganglia (BG), is assumed to be responsible for the adventitious movements and the behavioral manifestations of SC. Husby et al,  using immunofluorescent staining, demonstrated specific cross-reactivity of IgG antibodies to neuronal cytoplasmic antigens of the caudate and subthalamic nuclei. BG involvement in SC is supported by postmortem studies [9-11] and functional and structural brain imaging. [12-16] Case reports of brain imaging strongly suggest BG involvement in SC, but there has not been a reported multisubject quantitative brain imaging study of SC. In addition to providing information about BG dysfunction in SC, a more detailed analysis of BG structures is of interest because of the association of SC with OCD, a disorder possibly secondary to BG dysfunction. We compare in vivo quantitative MRI morphology of BG structures in 24 pediatric subjects with acute SC with 48 age-, height-, weight-, handedness-, and gender-matched controls. Subjects with recent onset of chorea were referred by pediatricians and neurologists nationwide. Each potential subject was evaluated by a pediatric neurologist (C.P. and/or M.B.S.) and only cases of recentonset SC were accepted. Because SC is frequently a diagnosis of exclusion, children were not accepted into the study if they had a personal or family history of hereditary causes of chorea, other neurologic abnormalities, or other infectious, immunologic, metabolic, or degenerative causes of chorea. Assessment included a medical history, laboratory tests, and physical and neurologic examinations,  including ratings of chorea severity modified from Aron et al. In addition, all subjects underwent the structured psychiatric interviews and neuropsychological tests as described below for the control group. The protocol was approved by the Institutional Review Board of the National Institute of Mental Health. Written assent from the child and consent from the parents were obtained. All subjects were imaged on a GE 1.5-tesla Signa imager. T1-weighted images with section thickness of 1.5 mm in the axial and sagittal planes and 2.0 mm in the coronal plane were obtained using threedimensional spoiled gradient recalled echo in the steady state (3D SPGR). Imaging parameters were TE equals 5, TR equals 24, flip angle equals 45 degrees, acquisition matrix equals 192 times 256, NEX equals 1, and FOV equals 24 cm. Head position was standardized by assuring that three external markers (vitamin E capsules in the meatus of each ear and one taped to the left inferior orbital ridge) were all visible in the same axial reference plane. Foam padding was placed on both sides of the patient's head to minimize head movement. Subjects underwent imaging in the evening to promote their falling asleep in the imager. Younger children were allowed to bring blankets or stuffed animals into the imager and have their parents read to them. Sedation with chloral hydrate (1.5 to 2.0 g by mouth) was used for four of the SC subjects. Control subjects were not sedated. The caudate nuclei and putamen were measured on all coronal sections on which they were visible. The globus pallidus (GP) was measured on coronal sections beginning 2 mm anterior to the anterior commissure and proceeding posteriorly for a total of 14 mm. Limiting sampling to this domain, which encompassed almost the entire GP in the majority of subjects, improved intrarater reliability. Distinctions between internal and external components of the GP were not reliably discernible with our methodology. Volumetric quantification of the thalamus was not possible with our methods. To provide a limited measure of thalamus size the area from a single midsagittal section was used. The midsagittal section was reconstructed from the axial series, which allows more precise designation of the midsagittal plane than choosing a ``best'' midsagittal section from the sagittal series. Total cerebral volume was determined from axial sections using a supervised thresholding technique that separates gray and white matter from CSF. The designation ``prefrontal'' was given to all brain matter anterior to the anterior-most point of the genu of the corpus callosum, excluding temporal lobe tissue. The designation ``midfrontal'' was given to all brain matter posterior to the plane at the tip of the genu and anterior to the anterior commissure. It should be noted that these boundaries are somewhat arbitrary and are not based on histologic or cytoarchitectonic characteristics. T tests were used to assess group differences in age, height, weight, and total brain volume. Chi square was used to assess handedness differences. Intraclass correlation coefficients were used to assess intrarater reliability of measurements. For a given structure the same rater performed all of the measurements blind to any subject characteristics. Repeatedmeasures ANOVA was used to assess group differences in structure size. Since there were no group differences in total brain volume, results are reported for the actual volumes, uncorrected for brain size. A univariate analysis was performed to assess normality of distribution of the data. Spearman's correlations were used to assess the relationships between those structures that differed between groups and measures of chorea severity, obsessive compulsive symptom severity, duration of symptoms, and exposure to neuroleptics. Intraclass correlations of interrater reliability were as follows: caudate equals 0.88, putamen equals 0.84, GP equals 0.82, thalamus equals 0.85, total cerebral volume equals 0.99, prefrontal region equals 0.98, midfrontal region equals 0.98. As indicated in Table 2, there were no differences in volume of the total hemispheres, prefrontal, or midfrontal regions, or thalamus area. In contrast, the caudate, putamen, and GP were all significantly larger in the SC group. The differences averaged 10% for the caudate and GP and 7% for the putamen. The Figure 1 shows scatterplots of the BG structures demonstrating large variance of structure size and considerable overlap between groups, but larger mean values for the caudate, putamen, and GP in the SC group. As seen, few patients' volumes exceeded the normal range, although about half of the normal subjects' measures were below the patient range. Symmetry measures of BG structures did not differ between the groups. Figure 1. Scatterplots of basal ganglia volumes (ml) by diagnosis for 24 subjects with Sydenham's chorea and 48 age-, height-, weight-, and gender-matched controls. In the SC group, there were no significant correlations between brain structure size and duration of symptoms prior to imaging, degree of obsessivecompulsive symptom severity, total dosage or duration of neuroleptic use prior to imaging, or severity of choreiform movements. Dysfunction of any portion of the complex circuitry of the BG might account for the manifestations of SC. [23-26] In our study, the caudate, putamen, and GP all demonstrated volumetric differences. Since most neural circuitry models identify a direct pathway involving the internal component of the GP and an indirect pathway involving the external component of the GP and the subthalamic nucleus,  the inability of our methodology to discriminate between the internal and external components of the GP represents a noteworthy methodologic limitation. The lack of difference in prefrontal volume, midfrontal volume, or thalamic area is consistent with earlier work indicating some specificity of the antigens to BG structures. 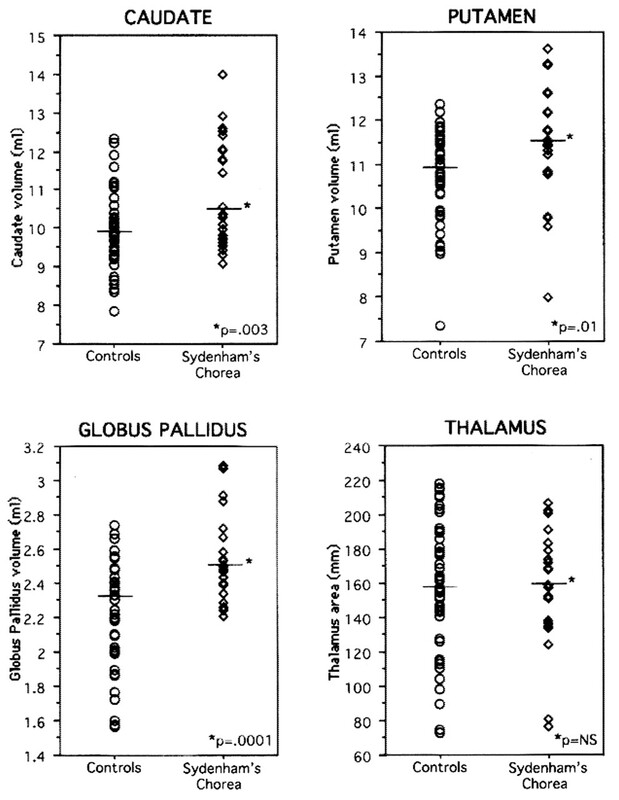 The lack of differences in the thalamus may reflect insensitivity of our technique (ie, measuring one midsagittal section of the entire thalamus to assess functionally discrete nuclei within it) or that the pathophysiology of SC does not affect the size of the thalamus. A possible confounding factor is neuroleptic exposure, as this has been related to increased volume of BG in young schizophrenia patients. In our sample, there were no correlations between BG sizes and total dosage or duration of neuroleptic exposure prior to imaging, although the interaction of a neuroleptic-mediated process with an inflammatory reaction may be difficult to discern. The large variability and considerable overlap in structure size between SC subjects and controls make volumetric MRI of limited diagnostic utility in this disorder, although MRI may be useful to rule out other focal disorders that cause chorea. In summary, this is the first systematic quantitative MRI study of SC using a large sample to examine neuroanatomic differences in various BG structures. Significant and specific increases in size were present for the caudate, putamen, and GP. These results are consistent with a hypothesis of a cross-reactive antibody-mediated inflammation of the BG as being the pathophysiologic mechanism for this disorder. Stollerman GH. Rheumatic fever. In: Wilson JD, Braunwald E, Isselbacher KJ, et al, eds. Harrison's principles of internal medicine. New York: McGraw Hill, 1991:935. Ebaugh FG. Neuropsychiatric aspects of chorea in children. JAMA 1926;87:1083-1088. Swedo SE, Leonard HL, Schapiro MB, et al. Sydenham's chorea: physical and psychological symptoms of St. Vitus dance. Pediatrics 1993;91:706-713. Special Writing group of the Committee of Rheumatic Fever, Endocarditis, and Kawasaki Disease of the Council on Cardiovascular Disease of the Young of the American Heart Association. Guidelines for the diagnosis of rheumatic fever. Jones Criteria, 1992 update. JAMA 1992;268:2069-2073. Taranta A, Stollerman GH. The relationship of Sydenham's chorea to infection with group A streptococci. Am J Med 1956;20:170-175. Goldenberg J, Ferraz MB, Fonseca ASM, Hilario MO, Bastos W, Sachetti S. Sydenham chorea: clinical and laboratory findings. Analysis of 187 cases. Rev Paul Med 1992;110:152-157. Ayoub EM, Wannamaker LW. Streptococcal antibody titers in Sydenham's chorea. Pediatrics 1966;38:946-956. Husby G, Van De Rijn I, Zabriskie JB, Abdin ZH, Williams RC. Antibodies reacting with cytoplasm of subthalamic and caudate nuclei neurons in chorea and acute rheumatic fever. J Exp Med 1976;144:1094-1110. Ziegler LH. The neuropathological findings in a case of acute Sydenham's chorea. J Nerv Ment Dis 1927;65:273-281. Greenfield JG, Wolfsohn JM. The pathology of Sydenham's chorea. Lancet 1922;32:603-606. Kolb B, Whishaw IQ, Fundamentals of human neuropsychology. San Francisco: Freeman, 1980. Goldman S, Amrom D, Szliwowski HB, et al. Reversible striatal hypermetabolism in a case of Sydenham's chorea. Mov Disord 1993;8:355-358. Jergas M, Heye N, Pohlau D, Schaffstein J. Computertomographische Befunde bei Chorea minor (Sydenham) [Computed tomographic findings in chorea minor (Sydenham's chorea)]. Rofo Fortschr Geb Rontgenstr Neuen Bildgeb Verfahr 1992;157:288-290. Kienzle GD, Breger RK, Chun RWM, Zupanc ML, Sackett JF. Sydenham chorea: MR manifestations in two cases. AJNR Am J Neuroradiol 1991;12:73-76. Konagaya M, Konagaya Y. MRI in hemiballism due to Sydenham's chorea [letter]. J Neurol Neurosurg Psychiatry 1992;55:238-239. Heye N, Jergas M, Hotzinger H, Farahati J, Pohlau D, Przuntek H. Sydenham chorea: clinical, EEG, MRI and SPECT findings in the early stage of the disease. J Neurol 1993;240:121-123. Swedo SE, Rapoport JL, Cheslow DL, et al. High prevalence of obsessive-compulsive symptoms in patients with Sydenham's chorea. Am J Psychiatry 1989;146:246-249. Swedo SE. Sydenham's chorea: a model for childhood autoimmune neuropsychiatric disorders. JAMA 1994;272:1788-1791. Aron AM, Freeman JM, Carter S. The natural history of Sydenham's chorea. Am J Med 1965;38:83-95. Denckla MB. Revised physical and neurological examination for subtle signs. Psychopharmacol Bull 1985;21:773-800. Welner Z, Reich W, Herjanic B, Jung K, Amado H. Reliability, validity and child agreement studies of the diagnostic interview of children and adolescents (DICA). J Am Acad Child Adolesc Psychiatry 1987;26:649-653. Rasband W. NIH Image (1.52). Bethesda, MD: National Institutes of Health (Public Domain), 1993. Hallet M. Physiology of basal ganglia disorders: an overview. Can J Neurol Sci 1993;20:177-183. Alexander GE, Crutcher MD, DeLong MR. Basal gangliathalamocortical circuits: parallel substrates for motor, oculomotor, `prefrontal' and `limbic' functions. Prog Brain Res 1990;85:119-145. Mink JW, Thach WT. Basal ganglia intrinsic circuits and their role in behavior. Curr Opin Neurobiol 1993;3:950-957. Gerfen CR. The neostriatal mosaic: multiple levels of compartmental organization in the basal ganglia. Annu Rev Neurosci 1992;15:285-320. Chakos MH, Lieberman JA, Bilder RM, et al. Caudate nuclei volumes increase in first episode schizophrenia with antipsychotic drug treatment. Am J Psychiatry 1994;151:1430-1436.